Media exposure is not the end of your marketing and corporate communications endeavors. In fact, media exposure is just the beginning of a corporate identity building process through positive publicity. The next logical step is media monitoring. It is an important process, because it helps you track your media exposure money and efforts and provide scope for an in-depth analysis of the quality of your media exposure. 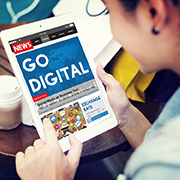 Today, both online and offline media offer a great opportunity for businesses to connect with their targeted audience in a much faster and efficient manner. Recognizing that media presence is a crucial part of any marketing strategy, Outsource2india provides dynamic media intelligence services that help you gauge the current trends to align your online sources to augment revenue generation. With a growing list of clients including media and planning agencies, production companies, research and analytics firms, advertisers, PR firms and other industry affiliates, Outsource2india provides a comprehensive approach to media research. Right from innovation to concept testing through advanced analytics, we offer a range of specialized services that help you strengthen your brand. Outsource2india offers specialized media research services that provide key insights on the flow of information in different regions, markets, communities, and channels shape and work. Our Media research specialists come with varied industry research experience and are adept at understanding complex media research needs. Our team helps you identify and understand consumer behavior, including their views, opinions, preferences, tastes, and attitudes in real-time to help you organize your marketing strategies to meet changing market needs. At Outsource2india, we offer affordable media monitoring services in streams like TV news channels, print publications, websites/portals, and blogs. Our team constantly monitors and analyzes how media is portraying your business, and you get the latest media updates related to your company so that you can take swift action. To keep a track of all the above diverse set of channels, you need a media research team with excellent analytical and tracking skills, not to mention advanced media monitoring tools and contacts with media professionals, to do justice to the entire process. Print Publications - The team at Outsource2india is capable of monitoring media publications across the globe. Our team is experienced in tracking mainline, financial, and vernacular newspapers and magazines to report how the media is portraying your company. We also monitor press releases, editorials, tenders, advertisements, and articles etc. TV News Channels - Our media monitoring team helps you keep a track of your company's representation in the world's leading television news channels. Our advanced infrastructure and tools enable us to track mainline and regional news channels for the latest interviews, business news, reports, tickers, and stock analysis pertaining to your company. Online Media Monitoring - Websites and Portals - With the internet making its way into traditional marketing as a strong contender, Outsource2india has extended its media monitoring services to add more value to your media tracking mix by including news section in numerous news sites, opinion-based websites, and financial portals. Blog Monitoring - Outsource2india has the team and infrastructure to provide comprehensive blog monitoring coverage for your company across the millions of blogs available online. Our team has hands-on experience in handling automated blog monitoring that ensures almost no missed blog postings. At Outsource2india, we also offer a digital clip book to store all your blog clips. This enables you to access your market intelligence from blog clips on an anywhere, anytime basis. 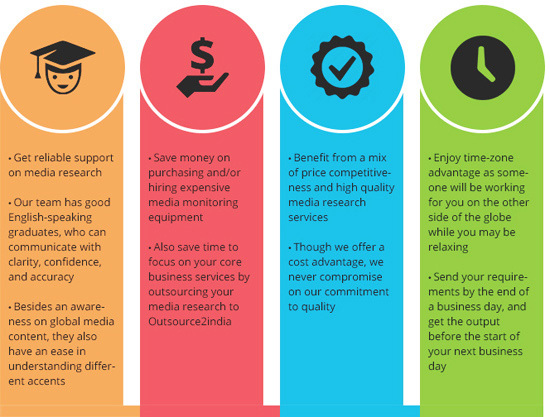 Why Choose Outsource2india for Media Research Services? At Outsource2india, we provide tailor-made solutions for each of our clients. When you choose us as your media research services partner, our media research team devises a relevant solution that suits your needs precisely. We extract any available information about your company from radio programs, newly printed magazines and television programs amongst others. We are one of the oldest and most trusted professional media research company with a global presence. Outsource2india ensures high-quality research services at cost-effective rates and faster turnaround time. If you have decided on outsourcing media research services to India, look no further. Contact us to learn how our business media research services can help you and your brand in a much effective manner.